Iran and the P5+1 group of countries (the United States, Britain, France, Germany, Russia, and China) have once again extended their negotiations in pursuit of a final, comprehensive solution on Iran’s nuclear program under the Joint Plan of Action (JPA). The November 2013 JPA set out a process aimed at limiting Iran’s nuclear program in exchange for relief from economic and financial sanctions. On a separate but linked negotiating track, Iran and the International Atomic Energy Agency (IAEA) have been working on a step-wise approach to address the IAEA’s concerns, particularly those about the alleged past and possibly on-going military dimensions (or so-called PMD) of Iran’s nuclear program. However, this process has stalled and Iran has become increasingly resistant to addressing the IAEA’s concerns. Whether and how Iran complies with the IAEA’s concerns is currently being played out in the context of P5+1/Iran negotiations. Despite some progress in the negotiations, much reportedly remains to be settled. The primary goal of a comprehensive solution is to ensure that Iran’s nuclear program is indeed peaceful, against a background of two decades of Iran deceiving the IAEA about its nuclear programs, including military nuclear programs. This long history of deception and violations places additional burdens on achieving a verifiable long term agreement, including the need for any agreement to last for about 20 years. A good deal should increase significantly the time needed to produce enough nuclear explosive material for a nuclear weapon, typically known as a breakout timeline. The United States reportedly often talks about achieving breakout times of one year. To achieve such a breakout time, Iran will need to limit specific, existing nuclear capabilities, including reducing significantly the number of its centrifuges and the size of its uranium and low enriched uranium stocks, and limiting its centrifuge R&D programs. A sound deal will also require Iran to verifiably address the IAEA’s concerns about its past and possibly on-going work on nuclear weapons, which means Iran must address those concerns in a concrete manner before a deal is finalized or any relief from economic or financial sanctions occurs. In the latter case, a deal could be signed and followed by an implementation period during which Iran would implement its key commitments, including addressing the IAEA’s concerns, before key economic and financial sanctions are relaxed. The agreement will need to include verification provisions that go beyond the IAEA’s Additional Protocol. These supplementary provisions will need to create a critical baseline of information, including how many centrifuges Iran has made, how much natural uranium it has produced and is producing annually, and its inventory of raw materials and equipment for its centrifuge program. This baseline is necessary if the agreement is to provide assurances about the absence of secret nuclear activities and facilities. United Nations Security Council sanctions on proliferation sensitive goods will need to continue. They will need to be enforced rigorously, while allowing verified exemptions for authorized nuclear programs. The annex to my testimony contains a more detailed discussion of key necessary provisions in a long term agreement. Without these limitations on Iran’s nuclear programs and expanded verification conditions, a long term deal will likely fail or exacerbate the threat from Iran. However, an adequate agreement is possible and within reach of the United States and its negotiating partners. A key goal of the negotiations is to ensure that any deal provides adequate reaction time, namely, adequate time to respond diplomatically and internationally to stop Iran if it does decide to renege on its commitments and build nuclear weapons. According to Undersecretary of State Wendy Sherman, “We must be confident that any effort by Tehran to break out of its obligations will be so visible and time-consuming that the attempt would have no chance of success.”1 That goal must be at the core of any agreement. 1 “Iran’s Current Enrichment Level Not Acceptable: US,” Agence France Presse. September 17, 2014. Obtaining adequate reaction time requires that limitations are placed on Iran’s sensitive nuclear programs, adequate verification is ensured, and concrete progress has been demonstrated that Iran will address the IAEA’s concerns about its past and possibly on-going nuclear weapons efforts. Because of Iran’s long history of non-compliance with its safeguards obligations, a deal must last long enough, on order of 20 years, so that there is little risk of Iran seeking nuclear weapons. Covering all Breakout Paths to the Bomb. If Iran were to make the political decision to produce a nuclear weapon after signing a comprehensive nuclear deal, it is not possible to guess how it may proceed. Iran may use its declared nuclear facilities to secretly make enough highly enriched uranium (HEU) or plutonium for a bomb or it may build covert sites to make the HEU or separate the plutonium. Given that Iran has such a long history of building and conducting secret nuclear activities, U.S. negotiators need to take a broad view and secure a deal that makes all of Iran’s paths to the bomb time consuming and risky. Some have advocated that only the covert route to nuclear weapons is likely. Those who favor this view often rely on the U.S. 2007 National Intelligence Estimate, Iran: Nuclear Intentions and Capabilities. It concluded, “We assess with moderate confidence that Iran probably would use covert facilities—rather than its declared nuclear sites—for the production of highly enriched uranium for a weapon.” That assessment may have been true in 2007 when Iran had few centrifuges, and in fact, we now know, it was building a covert centrifuge plant at Qom called the Fordow facility. However, that statement no longer holds true. At this point in time, it is not certain that Iran would rely entirely on the covert pathway option for fear of getting caught again as it did in building the formerly secret Fordow facility, and long before it has enough weapon-grade uranium or separated plutonium for nuclear weapons. The revelation about the Qom enrichment plant was highly damaging to Iran’s international credibility. For example, Russia became much more critical of Iran after this revelation and the creation of damaging sanctions became easier. Therefore, Iran is unlikely to want to repeat that mistake without greater assurance of being able to successfully hide a covert program, something it likely lacks now and will not gain anytime soon if the long term deal is carefully crafted by the United States and its partners. Iran is more likely today to choose a safe route to preserving and further developing a capability to produce fissile material for a nuclear weapon. In the case of gas centrifuges, it is likely to seek to maintain and increase its capabilities at declared centrifuge sites, the associated centrifuge manufacturing complex, and centrifuge R&D facilities. It would view this path as the preferred one, because it can simply and legitimately claim that all its activities are civil in nature, even if it is actually hiding the goal of eventually seeking nuclear weapons. If it opts to make nuclear weapons in the future, its declared programs could serve as the basis for whatever it does next. Then, it could pursue breakout as it deems most appropriate, whether by misusing its declared centrifuge facilities, building covert ones, or using both paths together. Thus, the U.S. goal should be limiting sharply the number of centrifuges at declared sites and constraining centrifuge manufacturing and R&D activities, both of which could help outfit covert programs. This approach would greatly diminish Iran’s ability to break out to nuclear weapons. If Iran decides to build nuclear weapons in the future, it would have to start from this relatively low level of capability, regardless of the path it would actually select in the future. The long timeline to acquire enough HEU for a weapon may turn out to deter Iran from even trying. This strategy depends on creating a robust verification regime able to detect covert nuclear activities or a small, hidden away centrifuge plant. Iran has assuredly learned from its mistakes in hiding the Qom enrichment site. In fact, it has likely developed more sophisticated methods to hide covert nuclear activities. But robust verification, which requires measures beyond the Additional Protocol, can provide assurance that Iran is not hiding centrifuge plants or other nuclear capabilities in the future. These additional verification measures would ensure that Iran would have a very hard time creating or maintaining a covert program outside of its declared programs after signing a long term agreement. It is wiser to anticipate and block all of Iran’s potential future paths to the bomb, rather than guessing and choosing the wrong one. One assured way to quantify the concept of adequate reaction time when discussing limitations on uranium enrichment programs is to link timely reaction time to breakout time. Breakout time is the amount of time Iran would need to create enough weapon-grade uranium for a single nuclear weapon, if it reneged or cheated on the agreement. Additional time would be needed to fabricate the nuclear weapon itself but the creation of enough fissile material (weapon-grade uranium or separated plutonium) is widely accepted as the “long pole in the tent” of making a nuclear weapon and the only part of this process susceptible to reliable discovery and subsequent pressure. Other nuclear weaponization activities, such as producing high explosive components, electronic components, or uranium metal parts, are notoriously difficult to detect and stop. By focusing on breakout time—as defined above—the agreement would grant the international community a guaranteed period of time to react and prevent Iran’s success. The longer the breakout time, the more reaction options we have. A deal that enshrines a short breakout time is risky because if Iran were to make the decision to make a weapon, military intervention would be the only available response. Thus, time for Iran’s ability to produce enough weapon-grade uranium for a bomb must be sufficiently long to allow the international community to prepare and implement a response able to stop it from succeeding. Typically, the U.S. negotiators have sought limitations on Iran’s nuclear programs that lead to breakout times of twelve months. (ISIS has taken the position that under certain conditions six months would be adequate.) To better understand the implications of breakout, we have prepared a range of breakout calculations under a wide variety of current and posited centrifuge capabilities that in essence convert the reaction time, i.e. breakout time, into an equivalent number of centrifuges and stocks of low enriched uranium. One of the calculations considers an important case, namely the current, frozen centrifuge program under the JPA where Iran retains its existing, installed IR-1 centrifuges and no stocks of near 20 percent LEU hexafluoride. In this case, the breakout time is about two months, which is the same as public U.S. government estimates. If the number of IR-1 centrifuges were reduced to about 10,000, breakout time would grow to about three months, according to the ISIS estimates. To achieve a breakout time of twelve months in the case that stocks of 3.5 percent LEU are not limited to relatively small quantities, calculations point to a centrifuge program of about 2,000 IR-1 centrifuges. If stocks of LEU are limited significantly, these centrifuge quantities can increase but, as is discussed below, the total number of allowed centrifuges would not increase that much-- only to about 4,000-5,000 IR-1 centrifuges. A major problem is that the centrifuges would continue producing LEU, complicating the effective maintenance of a LEU cap. These principles flow from the effort to ensure that Iran’s nuclear program is peaceful and remains so. These principles also reflect long experience in negotiating arms control and non-proliferation agreements and a recognition of the strengths and weaknesses in those agreements to date. Iran on the other hand has emphasized the principles of cooperation and transparency. These principles are predicated on its assertion that its word should be trusted, namely its pronouncement that it will not build nuclear weapons. These principles also reflect its long standing view that any agreement should have constrained verification conditions and minimal impact on its nuclear programs, even allowing for their significant growth, despite the current lack of economic or practical justifications for such growth. Many of Iran’s negotiating positions have been rejected because they can be undone on short order, offering little practical utility in constraining its future abilities to build nuclear weapons. Iran on numerous occasions in the past has shown a willingness to stop cooperation with the IAEA and reverse agreed upon constraints, sometimes rapidly. A robust and painstakingly built international sanctions regime on Iran cannot be lifted in return for inadequate and reversible constraints. The negotiating process has shown the complexity of any agreement able to ensure that Iran’s nuclear program will remain peaceful. But by sticking to the above sound principles, potential compromises can be better evaluated and any resulting deal will be more likely to last. Despite a great effort over the last year, the IAEA has learned little from Iran that has added to the inspectors’ ability to resolve their concern about Iran’s past nuclear weapons efforts and possibly on-going work related to nuclear weapons. Recently, the IAEA has also been unable to reach agreement with Iran on how to tackle the remaining military nuclear issues. The IAEA has repeatedly emphasized that the military nuclear issues need to be addressed and solved. For years, the inspectors have unsuccessfully asked the Islamic Republic to address the substantial body of evidence that Iran was developing nuclear weapons prior to 2004 and that it may have continued some of that, or related work, afterwards, even up to the present. Before a deal is implemented, concrete progress is needed on the central issue of whether Iran has worked on nuclear weapons and is maintaining a capability to revive such efforts in the future. Supreme Leader Ali Khamenei often declares that nuclear weapons violate Islamic strictures. His denials are not credible. The United States, its main European allies, and most importantly the IAEA itself, assess that Iran had a sizable nuclear weapons program into 2003. The U.S. intelligence community in the 2007 National Intelligence Estimate (NIE) agreed: “We assess with high confidence that until fall 2003, Iranian military entities were working under government direction to develop nuclear weapons.” The Europeans and the IAEA have made clear, the United States less so, that Iran’s nuclear weapons development may have continued after 2003, albeit in a less structured manner. In its November 2011 safeguards report, the IAEA provided evidence of Iran’s pre- and post-2003 nuclear weaponization efforts. The IAEA found, “There are also indications that some activities relevant to the development of a nuclear explosive device continued after 2003, and that some may still be ongoing.” To reinforce this point to Iran, the United States in late August sanctioned Iran’s Organization of Defensive Innovation and Research (SPND), which it said is a Tehran-based entity established in early 2011 that is primarily responsible for research in the field of nuclear weapons development. Thus, there is widespread evidence and agreement that Iran has worked on developing nuclear weapons and that some of those activities may have continued to today. Addressing the IAEA’s concerns about the military dimensions of Iran’s nuclear programs is fundamental to any long-term agreement. Although much of the debate about an agreement with Iran rightly focuses on Tehran’s uranium enrichment and plutonium production capabilities, an agreement that side steps the military issues would risk being unverifiable. Moreover, the world would not be so concerned if Iran had never conducted weaponization activities aimed at building a nuclear weapon. After all, Japan has enrichment activities but this program is not regarded with suspicion. Trust in Iran’s intentions, resting on solid verification procedures, is critical to a serious agreement. A prerequisite for any comprehensive agreement is for the IAEA to know when Iran sought nuclear weapons, how far it got, what types it sought to develop, and how and where it did this work. Was this weapons capability just put on the shelf, waiting to be quickly restarted? The IAEA needs a good baseline of Iran’s military nuclear activities, including the manufacturing of equipment for the program and any weaponization related studies, equipment, and locations. The IAEA needs this information to design a verification regime. Moreover, to develop confidence in the absence of these activities—a central mission—the IAEA will need to periodically inspect these sites and interview key individuals for years to come. Without information about past military nuclear work, it cannot know where to go and who to speak to. The situation today, unless rectified, does not allow for the creation of an adequate verification regime. Moreover, the current situation risks the creation of dangerous precedents for any verification regime that would make it impossible for the IAEA to determine with confidence that nuclear weapons activities are not on-going. Adding verification conditions to any deal is unlikely to help if the fundamental problem is the lack of Iranian cooperation. The IAEA already has the legal right to pursue these questions under the comprehensive safeguards agreement with Iran. Despite the IAEA’s rights under the comprehensive safeguards agreement, Iran has regularly denied the IAEA access to military sites, such as a site at the Parchin complex, a site where high-explosive experiments linked to nuclear triggers may have occurred. Iran has reconstructed much of this site at Parchin, making IAEA verification efforts all but impossible. Tehran has undertaken at this site what looks to most observers as a blatant effort to defeat IAEA verification. However, Parchin is but one of many sites the IAEA wants to inspect as part of its efforts to understand the military dimensions of Iran’s nuclear programs. A full Iranian declaration may reveal even more sites of concern. Iran continues to say no to IAEA requests to interview key individuals, such as Mohsen Fakrizadeh, the suspected military head of the nuclear weapons program in the early 2000s and perhaps today, and Sayyed Abbas Shahmoradi-Zavareh, former head of the Physics Research Center, alleged to be the central location in the 1990s of Iran’s militarized nuclear research. The IAEA interviewed Shahmoradi years ago about a limited number of his suspicious procurement activities conducted through Sharif University of Technology. The IAEA was not fully satisfied with his answers and its dissatisfaction increased once he refused to discuss his activities for the Physics Research Center. Since the initial interviews, the IAEA has obtained far more information about Shahmoradi and the Physics Research Center’s procurement efforts. The need to interview both individuals, as well as others, remains. If Iran is able to successfully evade addressing the IAEA’s concerns now, when biting sanctions are in place, why would it address them later when these sanctions are lifted, regardless of anything it may pledge today? Iran’s lack of clarity on alleged nuclear weaponization and its noncooperation with the IAEA, if accepted as part of a nuclear agreement, would create a large vulnerability in any future verification regime. Iran would have clear precedents to deny inspectors access to key facilities and individuals. There would be essentially no-go zones across the country for inspectors. Tehran could declare a suspect site a military base and thus off limits. And what better place to conduct clandestine, prohibited activities, such as uranium enrichment and weaponization? Iran would have also defeated a central tenet of IAEA inspections—the need to determine both the correctness and completeness of a state’s nuclear declaration. The history of Iran’s previous military nuclear efforts may never come to light and the international community would lack confidence that these capabilities would not emerge in the future. Moreover, Iran’s ratification of the Additional Protocol or acceptance of additional verification conditions, while making the IAEA’s verification task easier in several important ways, would not solve the basic problem posed by Iran’s lack of cooperation on key, legitimate IAEA concerns. Other countries contemplating the clandestine development of nuclear weapons will certainly watch Tehran closely. With a seven month extension, there is plenty of time for Iran to address all the IAEA’s outstanding concerns. Moreover, an approach can be implemented whereby Iran can choose to admit to having had a nuclear weapons program, or at least accept or not publicly dispute a credible IAEA judgment that it had one, and allow IAEA access to key military sites, such as Parchin, and to critical engineers and scientists linked to those efforts. If no such concrete demonstration is forthcoming during the extension, a deal should not be signed. If it is, the deal should not offer any significant relief from financial and economic sanctions until Iran fully addresses the IAEA’s concerns. A comprehensive nuclear agreement is not expected to end Iran’s illicit efforts to obtain goods for its missile and other military programs. Iran appears committed to continuing its illicit operations to obtain goods for a range of sanctioned programs. On August 30, 2014, Iranian President Hassan Rouhani stated on Iranian television: “Of course we bypass sanctions. We are proud that we bypass sanctions.” Given Iran’s sanctions-busting history, a comprehensive nuclear agreement should not include any provisions that would interfere in efforts of the international community to effectively sanction Iranian military programs. 2 Aside from the IR-2m and a few other centrifuge models, little is known about Iran’s next generation centrifuges. Quarterly IAEA safeguards reports indicate that Iran has not successfully operated next generation centrifuges on a continuous basis or in significant numbers since their installation began at the Natanz Pilot Fuel Enrichment Plant. This suggests that Iran may be having difficulty with aspects of their design or operation. Iran’s failure to deploy next-generation centrifuges in significant quantities is one indication that sanctions were effective to slow or significantly raise the costs of procurement. These conditions argue for continuing all the UNSC and national sanctions and well-enforced export controls on proliferation-sensitive goods. Such goods are those key goods used or needed in Iran’s nuclear programs and nuclear weapon delivery systems, the latter typically interpreted as covering ballistic missiles. Sanctions should continue on the listed goods in the UNSC resolutions, many of them dual-use in nature, and more generally on those other dual-use goods that could contribute to uranium enrichment, plutonium reprocessing, heavy water, and nuclear weapon delivery systems (see United Nations Security Council resolution 1929, par. 13). The latter is often referred to as the “catch-all” provision and mirrors many national catch-all requirements in export control laws and regulations. In the case of Iran, this provision is especially important. Without illicitly obtaining the goods covered by catch-all, Iran would be severely constrained in building or expanding nuclear sites. The P5+1 powers need to manage carefully the transition to a time when imports of goods to Iran are allowed for legitimate nuclear and later possibly for civilian uses. Many proliferation sensitive goods are dual-use goods, which have applications both in nuclear and non-nuclear industries and institutions. Currently, the world is on heightened alert about Iran’s illicit procurements for its sanctioned nuclear, missile, and military programs. Routinely, this alert has led to the thwarting of many illicit purchases and interdictions of banned goods. But as nations enter into expanded commercial and trade relationships with Iran, a risk is that many countries will effectively stand down from this heightened state of awareness and lose much of their motivation to stop banned sales to Iran even if UN sanctions remain in place. Despite the sanctions and vigilant efforts today, many goods now make their way to Iran illicitly that fall below the sanctions list thresholds but are covered by the catch-all condition that bans all goods that could contribute to Iran’s nuclear program. The volume of these sales is expected to increase after an agreement takes effect and many more of these goods could get through successfully. Unless carefully managed, a key risk is that the sanctions may not hold firm for the below threshold or catch-all goods. Stopping transfers of explicitly banned items may also become more difficult as business opportunities increase and much of the world de-emphasizes Iran’s nuclear program as a major issue in their foreign policies and domestic regulations. This could be particularly true for China and middle economic powers, such as Turkey, which already have substantial trade with Iran and are expected to seek expanded ties. Other countries with weak export controls may expand trade as well. The six powers must carefully plan for these eventualities now and include in any agreement an architecture to mitigate and manage proliferation-related procurement risks. A priority is creating a verifiable procurement channel to route needed goods to Iran’s authorized nuclear programs. The agreement will need to allow for imports to legitimate nuclear programs, as they do now for the Bushehr nuclear power reactor. The creation of the architecture should be accomplished during the negotiations of the long-term deal, although its implementation may need to wait. It will be important that the architecture, whether or not implemented later, be established at the very beginning of the implementation of the long-term agreement in order to adequately deal with this issue. In essence, the creation of the architecture should not be left to later. The reason for creating a verified procurement channel is that Iran’s legitimate nuclear activities may need imports. The “modernization” of the Arak reactor would probably involve the most imports, depending on the extent to which international partners are involved. A sensitive area will be any imports, whether equipment, material, or technologies, which are associated with the heavy water portion of the reactor, in the case that the reactor is not converted to light water. Another sensitive set of possible imports involves goods related to the separation of radionuclides from irradiated targets, although goods for reprocessing, i.e. separating plutonium from irradiated fuel or targets, would be banned since Iran is expected to commit in the long-term agreement not to conduct reprocessing. Nonetheless, allowed imports could include goods that would be close in capability to those used in reprocessing, since the boundary in this area between sensitive and non-sensitive equipment is very thin. These goods will therefore require careful monitoring. Iran’s centrifuge program, if reduced in scale to the levels required for U.S. acceptance of a deal, will result in a large excess stockpile of key goods for IR-1 centrifuges. This stock should last for many years, eliminating the need for most imports. Nonetheless, the centrifuge program may need certain spare parts, raw materials, or replacement equipment. If Iran continues centrifuge research and development, that program may require sensitive raw materials and equipment. Needless to say, the goods exported to Iran’s centrifuge programs will require careful monitoring as to their use and long term fate. and other proliferation sensitive goods. Currently, these civil industries (Iran’s petro-chemical and automotive industries are two such examples) are essentially denied many of these goods under the UNSC resolutions and related unilateral and multilateral sanctions. However, if civilian industries are to be eventually exempted from the sanctions, this exemption must be created with special care, implemented no sooner than many years into the agreement, and monitored especially carefully. Iran could exploit this exemption to obtain goods illicitly for banned activities. It could approach suppliers claiming the goods are for civil purposes but in fact they would be for banned nuclear or military programs. Such a strategy is exactly what Iran’s nuclear program has pursued illicitly for many years, including cases where goods were procured under false pretenses by the Iranian oil and gas industry for the nuclear program. There are also many examples of illicit Iranian procurements for its nuclear program where Iranian and other trading companies misrepresented the end use to suppliers. This architecture covering proliferation sensitive goods should remain in place for the duration of the comprehensive agreement. The six powers must carefully plan for eventualities now and design and implement an architecture that prevents future Iranian illicit procurements under a comprehensive agreement. If Iran accepts a sharp limit on the number of centrifuges that would enrich uranium in a comprehensive deal, what about the excess centrifuges? If the limit is about 4,000 IR-1 centrifuges, Iran would need to dismantle or render unusable over 14,000 IR-1 centrifuges and over 1,000 of the more advanced IR-2m centrifuges. These 1,000 IR-2m centrifuges are equivalent of about 3,000-5,000 IR-1 centrifuges. Thus, Iran would need to eliminate a large fraction of its centrifuge program. The centrifuges in excess of a limit should ideally be destroyed. Otherwise, Iran could re-install them, building back to its original enrichment capacity of over 20,000 swu per year. This restoration of capacity would lead to very short breakout times, far less than a year. However, rather than focusing on negotiating the destruction of excess centrifuges, the P5+1 negotiators appear to be seeking a different solution. They have reportedly been focusing on the removal and monitored storage of key centrifuge equipment in such a way that re-installation would be difficult and time-consuming. However, accomplishing build-back time frames of 6 to 12 months can be difficult to achieve in practice. Complicating this approach and highlighting its risks, Iran’s reneging on a cap in centrifuges and moving to reinstall them may happen outside of any overt nuclear weapons breakout. Iran may argue that the United States has not delivered on its commitments and build back up its number of centrifuges in retaliation. By assuaging the international community that it is not breaking out, Iran may make any meaningful U.S. response difficult. Some analysts, including those at ISIS, have discussed imposing essentially what have been called in the North Korean context “disablement” steps, which would not involve the destruction of any equipment but delay the restart of installed centrifuges. However, ISIS’s attempts to define disablement steps on the centrifuge plants appear to be reversible in less than 6 months of diligent work. This time period applies to proposals to remove the centrifuge pipework from the centrifuge plants. Moreover, this estimated time for reassembling the centrifuge cascades remains uncertain and it could be shorter. There is no practical experience in disabling centrifuge plants; North Korea’s centrifuge program was not subject to disablement. It needs to be pointed out that some U.S. policymakers had a tendency to exaggerate the difficulty of undoing North Korean disablement steps imposed at the Yongbyon nuclear center on plutonium production and separation facilities. In fact, North Korea was able to reverse several of these steps relatively quickly. A lesson from the North Korean case is that disablement steps are highly reversible and in fact can be reversed faster than expected. A sounder strategy involves including disablement steps with the destruction of a limited, but carefully selected set of equipment. For example, the deal could include the destruction of certain key cascade equipment, such as valves and pressure or flow measuring equipment. Much of this equipment was imported from abroad in violation of supplier country export control laws or international sanctions. An agreed upon fraction of centrifuges and associated cascade piping and equipment should be kept available under monitored storage away from the centrifuge plants as spares to replace broken centrifuges and equipment. This number would be derived from the current rate of breakage which Iran would need to document with the aid of the IAEA. However, this rate is relatively well known now, as a result of the IAEA’s monitoring of Iranian centrifuge manufacturing under the JPA. Iran has provided the IAEA with an inventory of centrifuge rotor assemblies used to replace those centrifuges that have failed, and the IAEA has confirmed that centrifuge rotor manufacturing and assembly have been consistent with Iran’s replacement program for damaged centrifuges. Armed with a reliable breakage rate, the negotiators can define the limited stockpile of centrifuges necessary to avoid any Iranian manufacturing of IR-1 centrifuges. Another important limit on Iran’s nuclear program aims to ensure that an advanced centrifuge R&D program does not become the basis of a surge in capability in case a deal fails or of a covert breakout. Iran’s centrifuge research and development (R&D) program poses several risks to the verifiability of a comprehensive deal. Throughout the duration of a long-term comprehensive agreement, Iran’s centrifuge R&D program should be limited to centrifuges with capabilities comparable to the current IR-2m centrifuge. The numbers of centrifuges spinning in development cascades should be kept to at most a few cascades and these cascades should have limited numbers of centrifuges. catering to open-ended, economically unrealistic ambitions is both unnecessary and counterproductive, and also sets dangerous precedents for other potential proliferant states. Advanced centrifuges bring with them significant verification challenges that complicate the development of an adequate verification system. Even with an intrusive system that goes beyond the Additional Protocol, IAEA inspectors would be challenged to find such small centrifuge manufacturing sites, detect the relatively few secret procurements from abroad, or find a small, clandestine centrifuge plant outfitted with these advanced centrifuges. Moreover, with such a small plant needing to be built, Iran would also have a far easier time hiding it from Western intelligence agencies. As some have proposed, treating these two, reinforcing steps instead as a zero-sum game is counterproductive to achieving an adequate agreement. In this scheme, the number of centrifuges would be raised substantially, to 7,000, 8,000 or more IR-1 centrifuges or equivalent number of advanced ones, while lowering the stocks of 3.5 percent LEU toward zero. In one version of this scheme, only the amount of 3.5 percent LEU hexafluoride would be reduced toward zero via conversion into LEU oxide. Once in oxide form, it would somehow be considered no longer usable in a breakout. But this is wrong. Both chemical forms of LEU have to be considered since Iran can in a matter of months reconvert LEU oxide into hexafluoride form and then feed that material into centrifuges, significantly reducing total breakout time, particularly in cases where breakout times of 6-12 months are required. In fact, in these cases, when Iran would have to reconvert LEU oxide back to hexafluoride form, breakout timelines only grow by a matter of a few to several weeks. Moreover, Iran does not have a way to use large quantities of 3.5 percent LEU in a reactor, so irradiation cannot be counted on to render these oxide stocks unusable. This means that proposals that merely lower the quantity of LEU hexafluoride by converting it into oxide form or fresh fuel is an even more unstable, reversible idea than variants that lower total LEU stocks to zero. a smaller number still going from 60 to 90 percent, or WGU. 4. enriching from natural uranium to 3.5 percent LEU. This step would require a large number of centrifuges and thus fewer would be available for the other steps, lengthening breakout times. 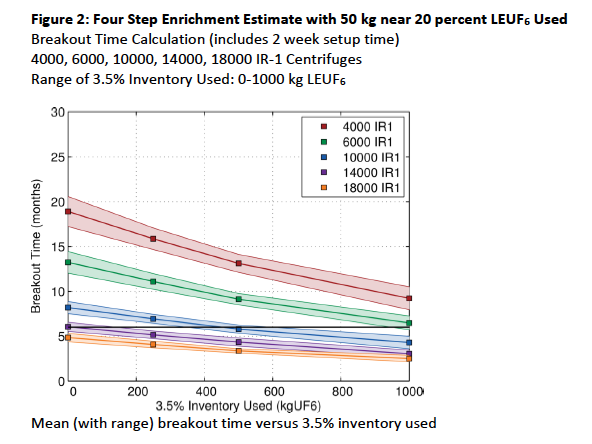 Figure 1 shows mean breakout times for a four-step process, where the amount of LEU varies from 0-1000 kilograms of 3.5 percent enriched uranium hexafluoride and each graph represents a fixed number of IR-1 centrifuges, from 4,000 to 18,000. In this case, it is assumed that Iran would have no access to near 20 percent LEU hexafluoride, a dubious assumption (see below). In the figure, a 6 month breakout time is represented by the black horizontal line on the graph. Several cases are noteworthy. For less than 6,000 IR-1 centrifuges, all of the breakout times exceed 6 months. For 10,000 IR-1 centrifuges, the breakout time is 6 months for stocks of 1,000 kilograms of 3.5 percent LEU hexafluoride and exceeds 6 months for lesser amounts of LEU. For 14,000 centrifuges, when the stock is below about 500 kilograms of 3.5 percent enriched uranium hexafluoride, the breakout time is 6 months or more. For 18,000 centrifuges, a 6 month breakout time only occurs for an inventory of 0 kilograms of 3.5 percent enriched uranium, a physical impossibility. That number of centrifuges would produce several hundred kilograms of 3.5 percent LEU hexafluoride every month. Much of this material would be in the product tanks hooked to the cascades and thus readily usable. So, cases of no LEU are not achievable. If instead a 1 year breakout time was selected, the numbers of centrifuges and LEU stocks would be significantly less. For example, in the unrealistic case of no available near 20 percent LEU, a breakout time of 1 year would correspond to 6,000 IR-1 centrifuges and a stock of 500 kilograms of 3.5 percent LEU hexafluoride. In fact, a major weakness in proposals to reduce LEU stocks while keeping centrifuge numbers relatively high is that the very product produced by the centrifuges, namely 3.5 percent LEU, would need to be regularly eliminated through some process. Obtaining this level of compliance would be challenging. Even if the LEU were to be shipped overseas, Iran could hold back sending it abroad, building up a large stock. Similarly, if it were converted into an oxide form, Iran could delay doing so, feigning problems in the conversion plant or delays in transporting it to the plant for conversion. Moreover, conversion to oxide as mentioned above can be rapidly reversed, allowing a three-step process and significantly faster breakout. In the unlikely case of Iran not mustering any near 20 percent LEU hexafluoride, a plant with 10,000 IR-1 centrifuges would correspond to a six-month breakout limit if the stock did not exceed 1,000 kilograms of 3.5 percent LEU hexafluoride. In 2 months, however, another 500 kilograms could be produced in this number of centrifuges, with the total 3.5 percent LEU stock reaching 1,500 kilograms and allowing a three step breakout, which could occur in a matter of a few months. Thus, in practice, LEU stocks would need to be maintained at levels far below 1,000 kilograms, even in the case of 10,000 IR-1 centrifuges. And keeping the stocks below this limit would be very challenging over the duration of a deal. If Iran kept more than 10,000 IR-1 centrifuges, the situation is more untenable. The above discussion assumes that Iran could not use near 20 percent LEU hexafluoride. Why is this, in fact, unlikely to be the case? Iran has stockpiled relatively large quantities of near 20 percent LEU oxide, quantities way beyond what is necessary to fuel the Tehran Research Reactor. By using this stock, Iran could reduce breakout times considerably after reconverting the near 20 percent LEU oxide into hexafluoride form. Iran currently has enough near 20 percent LEU, if reconverted into hexafluoride form and further enriched, to yield enough weapon-grade uranium for a nuclear weapon. The comprehensive agreement should certainly further reduce the size of the near 20 percent LEU stock; however, Iran is not expected to eliminate this stock, as long as Iran will fuel the Tehran Research Reactor (TRR). In the future, Iran could start to reconvert this material to hexafluoride form in a matter of months and dramatically speed up breakout. Minimum breakout time versus 3.5% inventory used. Note: The results are calculated as breakout times for various numbers of centrifuges and amounts of 3.5% inventory used, with multiple scenarios for each number of centrifuges matched with a specific 3.5% inventory. Two sets of breakout times are reported in the figures mean with range and minimum value of all scenarios. The results in the text use the mean values. The minimum values are viewed as worst case estimates which may be unlikely to be achieved in practice. 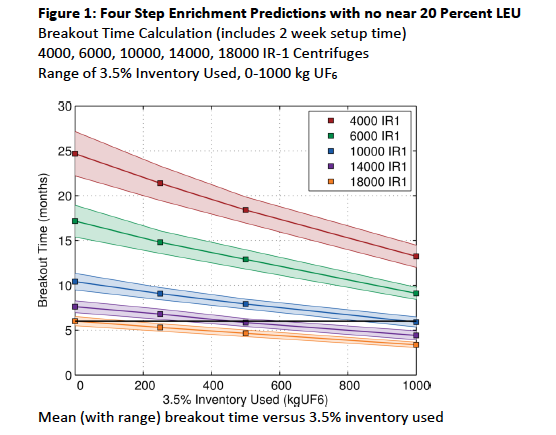 Figure 2 shows the impact of only 50 kilograms of near 20 percent LEU hexafluoride on mean breakout times, where again a four-step process is used. With just 50 kilograms of near 20 percent LEU hexafluoride, a stock of 500 kilograms of 3.5 percent LEU hexafluoride, and 10,000 IR-1 centrifuges, breakout time would be 6 months. If instead a one year breakout time was selected, the numbers of centrifuges and LEU stocks would again be significantly less. For example, a breakout time of one year would correspond to 6,000 IR-1 centrifuges and a stock of about 200 kilograms of 3.5 percent LEU hexafluoride. In the case of 4,000 IR-1 centrifuges, the breakout time would be about 12 months with about 700 kilograms of 3.5 percent LEU hexafluoride. If the LEU limit was set at about 500 kilograms of 3.5 percent hexafluoride, and given that a limit could easily be exceeded by a few hundred kilograms, the numbers of IR-1 centrifuges should not exceed 4,000-5000. In sum, lowering stocks in support of the fundamental goal of sharply limiting centrifuge numbers is a useful measure that would strengthen a deal. If stockpile limits are exceeded, that violation would pose minimal risk to the agreement as long as the centrifuge numbers are small. For comparison, in the case of no near 20 percent LEU discussed above, 10,000 IR-1 centrifuges could achieve a 6-month breakout only with a stock of 1,000 kilograms of 3.5 percent LEU hexafluoride. So, 50 kilograms of near 20 percent LEU hexafluoride is equivalent to roughly 500 kilograms of 3.5 percent LEU hexafluoride. If a stock of 50 kilograms of near 20 percent LEU hexafluoride is used in conjunction with a stock of 1,000 kilograms of 3.5 percent LEU hexafluoride, Iran would have enough LEU hexafluoride to use a three-step process to break out and achieve breakout times of a few months. So, in a realistic case whereby Iran would need to accumulate only 50 kilograms of near 20 percent LEU hexafluoride, a 6 month breakout would correspond to 10,000 IR-1 centrifuges and a stock of 3.5 percent LEU that could not exceed 500 kilograms. While in theory this limit could be maintained, in practice that is highly unlikely. Each month, such a plant would produce almost 250 kilograms of 3.5 percent LEU hexafluoride. In 2 months, Iran could exceed the cap by 500 kilograms, reaching a total of 1,000 kilograms of 3.5 percent LEU hexafluoride, or enough if used in combination with the near 20 percent LEU hexafluoride stock to reduce breakout times to about 4 months, all the while claiming that some reasonable problems prevent it from removing the excess material. Note: The results are calculated as breakout times for various numbers of centrifuges and amounts of 3.5% inventory used, with multiple scenarios for each number of centrifuges matched with a specific 3.5% inventory. Two sets of breakout times are reported in the figures: mean with range and minimum value of all scenarios. The results in the text use the mean values. The minimum values are viewed as worst case estimates which may be unlikely to be achieved in practice. Enrichment effort is measured in separative work units (SWU). However, setting limits on the annual SWU of a centrifuge plant has several problems. One is that determining the annual SWU of a centrifuge plant is difficult and its average value can change. Iran for example suggested in the negotiations that it would be willing to reduce the speed of its centrifuges and the amount of natural uranium fed into the centrifuge cascades, while it kept the same number of centrifuges. Both of these measures would reduce the annual SWU of the centrifuge plants, potentially significantly, even reduce it by a third of its existing enrichment output. But in a day, Iran could reduce these steps and reclaim its original enrichment capability; it is easy to increase the speed and the feed rate. Not surprisingly, Western negotiators soundly rejected this proposal. While SWU has a role to play in determining the equivalence of different types of centrifuges, it should not be a limit in its own right. where the reactor would use 5% enriched uranium fuel instead of natural uranium fuel and its power would be reduced by more than half, from 40 megawatts-thermal (MWth) to 10-20 MWth. This strategy would involve placing LEU fuel in a small fraction of the fuel channels in a large vessel – often called a “calandria”—through which the heavy water moderator and coolant flows. The Arak calandria has about 175 fuel and control rod channels. The LEU would be inserted into the middle section of the calandria with the majority of channels left empty. There are two problems remaining in this strategy, namely whether the calandria would be replaced with one sized for LEU fuel and the heat exchangers would be downsized appropriately to those needed for a 10-20 MWth reactor. Although the outcomes of reduced power and enriched uranium fuel are preferred, leaving Iran with an unmodified Arak calandria and its original heat exchangers constitutes an unacceptable proposal. If the core and heat exchangers were left intact, Iran could in a straightforward manner switch back to a natural uranium core and 40 MWth of power, undoing this limitation on plutonium production. This reconversion could occur in the open and under IAEA safeguards where Iran creates some pretext. In terms of the natural uranium fuel, Iran has already made significant progress on preparing a core load of natural uranium fuel, which could be finished, or the experience used to fabricate another one. Once switched back, Iran could run the reactor under safeguards to produce plutonium, even weapon-grade plutonium. Since the reactor would be fully operational, its destruction via military means would be dangerous and highly risky, and on balance unlikely to occur. Then, at the time of its choosing, Iran could breakout, having only to separate the plutonium from the spent fuel, which could be done utilizing a covert, low technology reprocessing plant in a matter of a few months. The designs for this type of plant are unclassified and readily available and such a plant would be very difficult for the IAEA (or intelligence agencies) to detect either during its relatively short construction or subsequent operation. At a minimum, Iran should remove the existing calandria and replace it with one sized appropriately for a core of the agreed upon number of LEU fuel assemblies. The existing one should be rendered unusable or removed from Iran. Despite the merits of modifying the Arak reactor, a more effective compromise remains upgrading the Arak reactor to a modern light water research reactor (LWR) which can be designed to be far more capable of making medical isotopes than the current Arak reactor design. It can also be designed to make plutonium production in targets much more difficult to accomplish than the Arak reactor or older style research reactors. A proposal to do so involves ensuring that the LWR is built irreversibly with a power of 10 MWth. This would require remanufacturing of the Arak reactor and changes to the heat exchangers and cooling system. Under this proposal, there is no need to produce heavy water, and the current stocks could be sold on the world market. Production of natural uranium oxide powder, fuel pellets, rods, and assemblies for the Arak IR-40 would be halted. Moreover, the associated process lines would also need to be shut-down, including the production of specifically IR-40 relevant materials such as zirconium tubes. In return, the P5+1 could assist Iran in producing fuel for the LWR. Iran could produce the necessary LEU in its enrichment program. The negotiations for a long-term deal are highly detailed and secret. Many technical provisions are being studied and proposed by the P5+1 negotiators, particularly U.S. officials. Iran has resisted many of these proposals and rejected most proposals that would lead to significantly lengthened breakout times. It is unclear if the differences can be bridged over the next several months. Nonetheless, it makes sense to review a set of provisions that can form the basis of a comprehensive solution able to protect adequately U.S. national security interests. This list has been developed based on a range of information and attempts to incorporate information about the provisions being discussed during the negotiations. However, there is no attempt to represent the U.S. or its allies’ positions. For more detail about the provisions presented here, the reader is referred to the ISIS web sites. This list of provisions is an update from lists prepared by ISIS in December 2013 and January 2014. The changes from those early lists reflect known concessions made by the parties to the negotiations, new developments not foreseen a year ago, or efforts to seek compromises. In addition, many of the provisions work together, such as limiting the number of IR-1 centrifuges, leaving only a small number of advanced centrifuges, mandating significantly reduced stocks of LEU, and removing or destroying centrifuges and associated equipment. As such, while specific limits can be set individually as below, when key provisions are considered in their entirety, these provisions may each differ from the cases stated below. However, the goal of a one year breakout would still be obtained. The provisions are organized in two broad categories, those without duration and those with a duration of 20 years. The latter could be subject to a phasing, such as after a fraction of the 20 years has passed, that would lead to gradual relaxation of the conditions or replacement by others. However, phasing is not included in this list. The Arak reactor complex will be modified to use enriched uranium fuel and a smaller core structure, or calandria. The reactor’s power will be reduced from the level currently planned, i.e. 40 megawatts-thermal, and the reactor’s heat removal system will be modified to fit that lower power rating. Iran will not reprocess any irradiated fuel or build a facility capable of reprocessing. Iran will not enrich above 5 percent in the isotope uranium 235, and will not produce stocks of enriched uranium that exceed in quantity the needs of its civilian program, noting that it has long term LEU fuel delivery agreements with Russia and would be expected to have additional ones with foreign reactor vendors after the conclusion of a comprehensive solution. Iran will commit not to procure goods for its nuclear programs abroad in a manner that is considered illicit (“illicit nuclear commodity trafficking or trade”). Iran will have only one enrichment site, the one at Natanz, and it will utilize IR-1 centrifuges. The number installed will be consistent with a one year breakout time frame. Considering significant reductions in LEU stocks, the number of allowed centrifuges could reach 4,000-5,000 IR-1 centrifuges. The Fordow enrichment site will be shut down or converted into a non-centrifuge-related site. Centrifuge research and development will be limited to centrifuges equivalent to the IR-2m centrifuge. The number of centrifuge cascades will be limited in number, and no cascade will have more than a few tens of centrifuges. In all cases, the number of advanced centrifuges in a cascade would be far lower than the amount to be used in a production-scale cascade. Major centrifuge component manufacturing and storage locations will be limited in number and identified. Centrifuge assembly will occur only at the Natanz enrichment site. When the long term agreement takes effect, centrifuges and all associated cascade equipment in excess of the cap would be turned off, so that no centrifuges are operating and the cascades are not under vacuum. Centrifuges would be turned off in a controlled manner so as to limit centrifuge damage. Excess centrifuges and the cascades containing them would be disabled in a manner so as to require six to twelve months to restart disabled cascades. Based on public information about the negotiations, excess centrifuges would not be destroyed but rather equipment from the cascades and centrifuges would be removed from the centrifuge plants making restart very time consuming. To ensure adequate build-back times, certain centrifuge or cascade equipment would be selectively destroyed. Any storage of equipment or uninstalled centrifuges would be subject to rigorous IAEA monitoring. Iran will not build any conversion lines that can convert enriched uranium oxide into hexafluoride form. LEU stocks will be limited, based on a realistic civil justification. With regard to near 20 percent LEU, Iran will not possess any such LEU in hexafluoride form and its total stock in unirradiated oxide form, including in fresh fuel elements and assemblies and scrap and waste, will be less than the equivalent of 100 kg of near 20 percent LEU hexafluoride. During the life of the agreement, this unirradiated stock will be further reduced to below the equivalent of 50 kg of near 20 percent LEU hexafluoride. Iran will not possess more than the equivalent of 500 kilograms of unirradiated, less than five percent LEU hexafluoride. Iran’s practical needs for LEU, such as in the modified Arak reactor, would require the use of a certain amount of LEU in a fuel fabrication pipeline. This amount would be determined as part of the agreement. Excess LEU will be shipped out of Iran. Uranium mining, milling, and conversion facilities will be limited in throughput to the actual need for enrichment or other mutually agreed upon use. detailed declarations of the number of centrifuges made in total, its total used and accumulated stocks of raw materials and equipment needed to build and operate centrifuges. Prior to the relaxation of major economic or financial sanctions, Iran will address the IAEA’s concerns about past and possibly on-going nuclear weapons or nuclear weapons-related work. United Nations Security Council sanctions on proliferation sensitive goods will continue throughout the duration of the agreement. At the beginning of the period of the comprehensive solution, a verified procurement channel will be established for items needed in Iran’s nuclear programs. The list of items will be established by mutual agreement and will include major nuclear facilities, nuclear components, nuclear and nuclear-related dual-use goods, and other sensitive items such as those on watch lists. Procurements of listed items outside this channel will be banned and considered illicit nuclear trade. By the end of the period in which the comprehensive solution will be in force, Iran will implement an export control system in line with the requirements of the four main export control regimes (lists and guidance) and submit a comprehensive report to the 1540 Committee on Iran’s implementation of the resolution. Iran will also commit not to export or otherwise transfer reprocessing or enrichment technologies or goods to any state or non-state actor after the comprehensive solution period ends. 3 Broken centrifuges will be replaced with centrifuges of the same type. This should mean, for example, that an installed IR-1 centrifuge would be replaced with an IR-1 centrifuge of the same design and enrichment capability as the one removed. A broken centrifuge is defined as one that has a rotor assembly incapable of spinning under power and cannot be repaired. 4 A model condition developed by ISIS: The state of concern agrees not to transfer to any state or entity whatsoever, or in any way help a state or entity obtain, nuclear weapons or explosive devices, or components of such weapons; nuclear material; nuclear know-how or technology; or equipment, material, goods, technology designed for, prepared for, or that can contribute to the processing, use, or production of nuclear materials for nuclear weapons or in sanctioned nuclear programs.